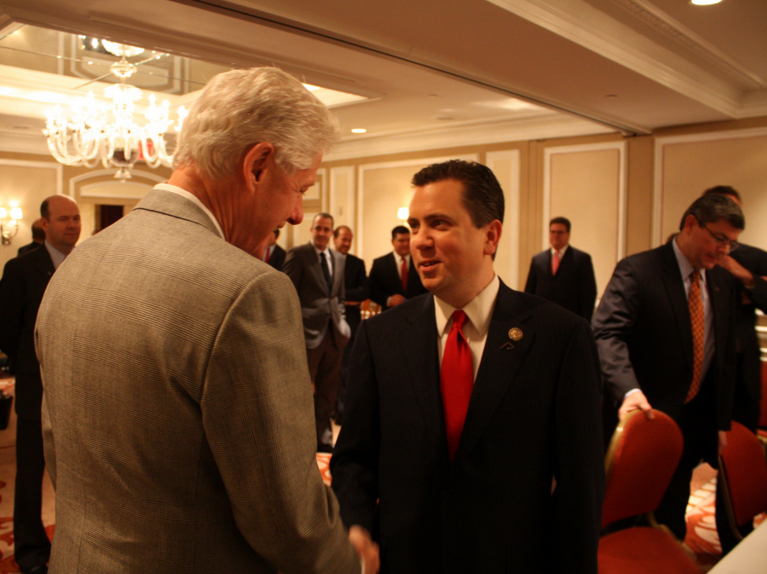 Then-U.S. Rep. Dan Boren talking with former President Bill Clinton during a 2011 meeting of the Blue Dog Coalition of conservative Democrats in New York. Boren, 42, hasn't started raising money or interviewing political consultants, but said he believes there is a ``very doable'' path for a Democrat to replace term-limited Republican Gov. Mary Fallin, despite GOP dominance at the polls in the last several cycles in Oklahoma. “I'm approaching this race, not based on whether or not other people in the race or whatever the political winds are, this is whether or not it's the right thing to do and also whether I could successfully govern,'' Boren said. Boren served one term as a state representative before running successfully for Congress in 2004 in Oklahoma's sprawling 2nd Congressional District in eastern Oklahoma, a seat he held for eight years before stepping down. His political connections run deep and extend across party lines. His grandfather, Lyle Boren, was a U.S. congressman and his father, University of Oklahoma President David Boren, is a former Oklahoma governor and U.S. senator. On Sunday, David Boren issued a statement saying he will encourage his son not to run for governor in 2018, saying in a statement "it is not a good idea.'" He added that he has always had a policy of not endorsing or campaigning for any candidate for governor. Neither David Boren nor Dan Boren immediately returned messages seeking further comment. Dan Boren's first cousin, Janna Little, is married to current House Speaker Paul Ryan, the 2012 Republican vice-presidential nominee. Boren undoubtedly would face stiff competition in a race for Oklahoma's open governor's seat in 2018, which will draw interest from strong candidates on both sides of the aisle. Potential Republican candidates include U.S. Rep. Jim Bridenstine, Lt. Gov. Todd Lamb, State treasurer Ken Miller and Attorney General Scott Pruitt. Other possible Democrats include ex-state Rep. Joe Dorman, who won 41 percent of the vote against Fallin in 2014 despite being heavily outspent, and House Minority Leader Scott Inman. A Republican political strategist said that, despite Boren's political ties and reputation as a moderate, no Democrat has much of a chance in 2018 if a Democrat is elected president in 2016.